Rumour of closure of St. James's Gate Brewery? I heard this during the two days of eating and drinking that Guinness(Diageo), might be selling the premises at St. James's Gate. Has anyone heard any mention of this, obviously it has always been a possibility, but what would the city be like if the brewery was torn down and some bloody apartments or shopping centre was put in? Is it ever a possibility that the government would purchase the land and preserve it? Yup, I heard that months back. There's a plan to sell James' Gate and move to a greenfield site in North Dublin.. especially if the port heads up to Balbriggan. Its being doing the rounds for a while - if it makes commercial sense then its likely to happen. Having your main distribution base stuck in the middle of an ever increasingly clogged city costs money. Sentiment will count for nothing here but if it is sold off then perhaps a small presence will be retained on site for forms sake. Only thing that might stop it in its tracks is a huge downturn in property values next year. I read at the weekend that they were looking at a number of possible sites. Leixlip was mentioned. It's gonna be a battle between sentiment and economics. The site could be worth up to a billion euro, which is a ludicrous amount of money to turn away. There's real potential for a great city quarter to be based around the proposed Heuston DART, Luas and intercity rail hub. It's partly earmarked for development in the Heuston gateway framework plan, but not in it's entirety. We could have high rise, new streets and linkages, great new urban spaces (finally) and a whole district based around pedestrians, cyclists and public transport - the sort of place that would put Docklands in it's rightful place as a shambles and a wasted opportunity. Leixlip and offshore are out of the question, because Diageo know that the brand value of Guinness is very closely associated with its Dublin image. They could not sustain the bad publicity of losing that. Nothing to do with sentimentality by the way, other than the customers' sentimentality - for Diageo, it's a straight commercial decision. That said, they could probably sustain a move to another site as long as they could say that it was 'in' Dublin, be it city or county. The real issue is how Diageo have destroyed a whole quarter of inner-city Dublin. With 70 per cent or more of their site derelict, they have dragged down the whole south-west party of Dublin city centre by forcing down values and eliminating many possible land uses, and attracting crime and anti-social behaviour. You only have to look at Victoria Quay, the south quay of the Liffey closest to Heuston Station. It is a grim, derelict and dreadful place. Other cities celebrate their riverfronts. On Victoria Quay, any pedestrian is lucky if all they suffer is being gassed with the fumes of the HGVs roaring past. Guinness is a massively profitable product. Dublin should not tolerate this multinational destroying a whole quarter of the city. Yeh. That's a very good point. Problem is that Guinness is seen as a prestige blue chip product for Dublin, and a pretty big reason tourists come here. As such, statements like yours rarely get a chance to be aired. It's similar in a way to the disgraceful treatment of Pearse St by TCD over the decades (now being addressed). Victoria Quay is a dead frontage, killed by Guinness. I couldn't agree more on this issue. Hopefully whatever happens here, and in the Digital HUb sites will help bring some life back to the SW inner city. This was in the press months ago. Ive no doubt they will sell up and move outside of the city. They will probably keep a token guinness 'musuem' for the visitors, but as to production in the city centre, its time is long gone. The Sunday Tribune had this story during the summer. Seemingly, the possibility of a greenfield site near the relocated port was being considered. Balbriggan seems a likely site whether or not the port moves. Easy proximity to the M1, port tunnel and export markets. The Guinness Storehouse® is Ireland's biggest visitor attraction and a huge money maker and would stay where it is. Yeh Balbriggan/Bremore will be the best place for it. TT there'll also more than likely be the Outer Orbital Road near it too to link to the rest of the radial road network. The tourist element will have to stay in the city centre though. However I look forward to seeing a 30 storey black glass tower with a creamy top 4 storeys located there. That'd be great. Arthur Towers! Diageo trades on a history which bears little relation to the present-day operation. Many people still believe that the brewery uses its own special supply of water from a source west of Dublin. 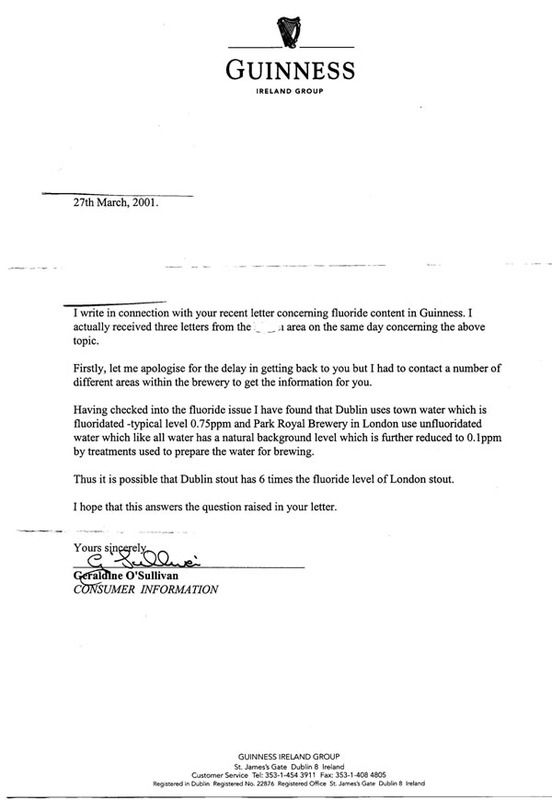 The truth is that for many years it has been using Dublin's tap water (see here), which is not good at all -- contaminated with fluoride (which Guinness doesn't remove), aluminium and chlorine compounds, and god-knows-what. There's similar nonsense on the Wikipedia page about Guinness: "The water used to brew Guinness comes from Lady's Well in the Wicklow Mountains..."
The grain of truth is that Dublin's tap water originates in the Wicklow Mountains of course. Water is a very important ingredient of beer. It's a pity that Diageo can't be honest about it. But they've been getting away with the deception for years, so I guess they think they can get away with anything now. I don't drink Guinness. I drink the finest German organic beers, which are much better and much cheaper (69 cents per half-litre). I've heard rumours locally that the Great Northern Brewery in Dundalk is now being considered. It is on the Belfast-Rosslare railway line, has easy access to NI, and is only 10 minutes away from the deep water port in Greenore. It has the advantage of being the second largest brewery in Ireland and Dundalk has a rich brewing heritage. The word is that the additional investment to increase it's capacity is a fraction of that to build on a green field site. Doctors, no less? You mean, real medical doctors? Stunning. Is it true that they have a 60 acre site at St James' Gate? If so, they only need to keep a couple of acres for a tourist experience venue and move production somewhere else in the greater Dublin area (for branding/ marketing purposes). Selling the rest would allow for redevelopment of that area of the city. PS: TCD didn't just kill Pearse St, they killed one side of Westland Row also. Until such time as TCD-owned premises on Pearse St & Westland Row are accessed by their "front doors", rather than from the Trinity side, these streets will remain largely dead. What am I missing? Guinness is fluoridated. Doctors are supposed to know about the toxicity of fluoride, a cumulative poison. Fluoridation is contrary to fundamental medical principles. There is not one Irish medical doctor willing to defend fluoridation in public debate. Anyone drinking lots of (Dublin-brewed) Guinness is going to sustain health damage from the fluoride. Yeh. That's a very good point. Problem is that Guinness is seen as a prestige blue chip product for Dublin, and a pretty big reason tourists come here. As such, statements like yours rarely get a chance to be aired. ... Victoria Quay is a dead frontage, killed by Guinness. I couldn't agree more on this issue. Hopefully whatever happens here, and in the Digital HUb sites will help bring some life back to the SW inner city. I don't know the exact measurements, but I'd say that 60 acres is a conservative estimate. A huge proportion of it is derelict, mostly because of changes in brewing technology, the brewery footprint is now much smaller. There used be two entirely separate breweries on the site, but both are now totally derelict. Also, Guinness have recently (if you believe the boards) sold several sites between James's Street and the river, so I don't know what they are up to there. Certainly the unneeded land is worth billions, but if you are a company like Diageo, holding onto it and keeping it derelict isn't a bad idea, in an era when land prices are increasing much faster than the bank interest rate. Now that isn't the case any more and their thinking may change, but we should start looking at a penal tax on unused land.